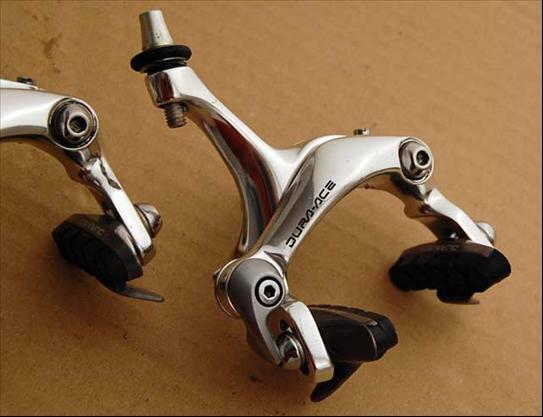 The first Dura-Ace dual pivot brake set. Shimano's top of the line race quality component group in the mid 80's through the early 90's. The 7400 series Dura-Ace group saw several interations including the introduction of 6 then 7 and finally 8 speed SIS shifting. Eventually upgraded with 7410 parts before finally being completely replaced with 7700. Dura-Ace was developed to give the professional racing cyclist a fraction-of-a-second advantage that can spell the difference between victory and defeat. Advanced functions like 8 speed SIS, Super SLR brakes and Shimano Total Integration provide the most refined feeling of control available in a group today. Ultra high-precision mechanisms, quality materials and rugged construction assure that Dura-Ace takes all the punishment that pro-level road racing can dish out. (1991 Dealer Manual).